Basin Spring Park, located in the heart of downtown Eureka Springs, Arkansas became renown for it’s healing waters from the very first days of Eureka Springs. What started out as just a spring, grew over the years to become a central spot for entertainment in Eureka Springs, Arkansas. Free live music in Basin Spring Park. Starting in April, through the end of the year, Basin Spring Park is also home to monthly FREE events that are not to be missed! Check out these fun and FREE monthly events in Basin Spring Park from now (April) through October! Every third Saturday from now though October, there will be free live performances at the amphitheater in Basin Spring Park! Aprils featured performer will be Luke Winslow-King, a delightful mix of country, blues, R&B, rock ‘n’ roll, and folk music. 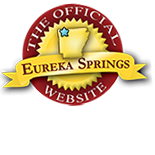 The acts change every month, so check the Eureka Springs Calendar of Events for updates! The Balcony Bar & Restaurant at the Basin Park Hotel is a good spot to see the sights and sounds of Basin Spring Park. Bring a drum or anything else that makes noise and join the drum circle with Angelo and his troupe of drummers and dancers. You will hear this event before you see it. The lively sounds of drumming eco through downtown Eureka Springs on the first Saturday of every month. Hang out in the park, or just enjoy the ambiance from the nearby Balcony Bar and Restaurant at the historic Basin Park Hotel. The Melonlight Dancers in Basin Spring Park. The fourth Saturday of the month brings the talented Melonlight Dancers to Basin Spring Park. The Melonlight Dancers entertain all ages, and if you’re willing, they’ll help you learn a step or two. This entry was posted on April 5, 2018 by service424 in Arts & Culture, Attractions, Basin Park Hotel, Family Fun, Festivals, Fun Downtown, Musical Adventures, Things to Do and tagged Balcony Bar, Basin Park Hotel, Basin Spring Park, free events, live music.